It is by an artist called Kevin Tong and is entitled The Hatch. Yep! See you all next Wed or Thurs for the next one! I'm going to have to find a way to stop myself from buying too many more of these. I originally told myself 3 unless I really liked another. And I now have 3, but we are only 1/2 way done. Oh Boy..this one is very Rene Magritte in origin..Should be fascinating in its 18x24 reality. This art sale is murder on my nerves! how does this one compare to the ken taylor or eric tan prints? Well that was a rush, just reading the comments was fun ! This does look like it will be another one to put under blacklight, even if it doesn't say anything on the site. Not that I'm complaining about so many Locke posters, but when are we going to see Sayid?!?! I don't think he had a wCM did he? I might have said this before, but Sayid and Nadia by the LAX hangar would be fantastic. Wow. That was still pretty fast. Amy (or anyone) do you remember the link to that site that had the high-res scans of the posters? Do they have one for this week's? The water cooler Sayid moment for me would be him tripping and snapping that guy's neck with his feet. ...Doubt they'd do it but Enter 77 had several crazy moments. The iced tea with Kate/Mikael, and of course Mikhail shooting Ms. Klugh which had my jaw drop. @Sayid'sgirl What about when he shot young Ben? That was a pretty big WaterCooler Moment, if you ask me! No that wasn't it... hmm. I'm sure if I dug through comments or old posts I could find it. Hold on. and it could look pretty neat re-interpreted as a poster. Congested - all back to normal now, I have to do that to get the banner picture sorted out. the allusion to "the all-seeing eye"
Does anyone know is the poster delivered U.S. mail, UPS, FedEx, etc.? The only thing missing from the poster, unless they are hidden in the detail somewhere, are the numbers. Maybe they added the "Sold Out" prematurely and took it off? Congested, if people were holding them in their carts, it would have said sold out, and then if they didn't buy them, they'd revert back to the unsold pile. Thank you. I take it people receive prints over a span of several days considering some have already gotten The Smoke Monster while others have not. I'm in the UK and haven't got my Smoke Monster yet. I think it just depends where you are in the world and what your local postal service is like. Ah, that explains it Amy. I better empty the cart then so someone can buy it as there obviously aren't very many left. Hefty on DarkUFO picked one up for ReverendMilo. That makes sense. I've got to say I was kind of just watching this "ARG" casually at first but have gotten really caught up in it. What a cool thing to do for the fans. What other show on T.V. could even come close to doing something this unique and special? I show it to now be sold out. Wow, very nice of them. I was wondering where Milo was. Wow...all that must have been so exciting while it was happening. Sorry, Zort, I was out playing Mah Jongg, and couldn't help with the URL. I checked my email and saw the URL was about to go live and all my Mah Jongg ladies were upset with me for trying to play and frantically trying to refresh pages on my little iPhone! They said it wasn't polite! Luckily, we then broke for lunch and I saw the poster...loved it...and ordered it.....#1300! Sorry I missed all the excitement! Little behind on comments but the site you're looking for congested is slashfilm(s). Yeah the neck snap with the legs was a good one. He's had alot of good fights with alot of people including Keamy. But I don't know if they would be considered WCM. Glad Rev was able to get one. I was also wondering where he was. Glad you got one before it sold out. I was really against this one, then decided to buy it because its one of my favorite scenes. Order number 1311. Also, order number 986 for the Smoke Monster. Not sure who's keeping track of the order numbers, but figured I'd add my name to the list. But I was charged yesterday for my Smoke Monster. I hope it arrives soon. I've loved a few of the posters so far, but this one is easily my least favorite. @congested - Hats Off to you for reaching out to Gabriel earlier this week as well as this afternoon. 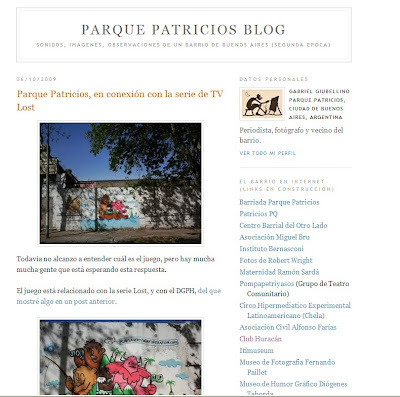 Judging by some of the comments on the Parque Patrcios Blog... they must think we're quite the bunch. You had mentioned we should somehow thank him... any ideas? I've got to say this is one of my favorite posters so far (right behind The Crash) because it captures so much of what the show is all about. Two weeks that posters have sold out in a few hours. My guess is that more and more folks are catching onto this ARG and posters will start to be snapped up quicker in the coming weeks. @zort - again, thank you for keeping us all in one place & what a great place it is. :) Suppose we'll get a day or two to catch our breath before the next clue. Till then! This Print by Kevin Tong..does my heart AND Mind , GOOD. It IS the SURREAL ,,that is LOST. I do not mean the Daliesque melting clock and whatnot " surreal", no, I mean the Andre Breton, the Rene Magritte, SURREAL. This print illustrates the generation of Surrealism as put forth by its founders and best presenters of the perspective Surreal,, And,,Lost 's place in the lineage of its continuation. The " interconnectivity" of all things human in the back ground, a Breton theme if there is one. Magrittes floating land mass above water is easy to find in any on line poster shoppe. Indeed,,whoo hoo, i used " Indeed,,the visual is the opposite of the great easter egg, only fools are enslaved by time and space. The Island floats free of both. Such is the nature of the Imagination. Mentioned was the " eye" aspect of this print. Lost does not own nor is the creator of the visual symbol, the metaphor ,of the " EYE". It was Breton who saw mankind divided by his perceptual habit of duality,,the exterior tangible world and the interior etheral world ,,and it was the EYE,,that was seen as the " Gateway" between both worlds.Breton and his original Surrealist wanted to Unify these two worlds, change mans habit of seeing them as two seperate realities,,to seeing them as one,,the Surreal. So the Light..extending to the non-bordered edge , can be seen as that vision. ..and there is the Locke figure,,Man Of Faith,,possibly suffering another meltdown,,on why his faith hasn't been answered..and all around him..is the answer to his longing. Ha! I'm having to translate the comments with Babelfish and the end results are pretty funny. Yes, Mel...as soon as I glimpsed it I had to have it. To me it is the essence of the mythology of Lost along with the pivotal moment of the light in the hatch going on. Having the island floating (which many have theorized)give it an other-worldly quality. Can't wait to scrutinize it in person! That's a really spectacular poster. A Sayid collage would be spectacular. Him & Nadia in the center, Iraqi desert in the background...a large bust of him in his Republican Guard outfit...upper right. Fixing the original radio they used to hear Rousseau's message...upper left...another close up of him pointing the gun at lil Ben, staring intently over the barrel, lower left...and finally....him clutching the shot and dying Shannon lower right. I think the background should slowly gradiate from desert background at the top...and segue into dark island jungle at the mid-to-bottom portion of the poster. I would BUY that one in an instant. Still hopeful we will start getting some 'photo realistic' shots of the cast members at some point. MEL, waited all day for that. Thank you. But as it was brief and to the point, I languish, waiting for deeper discourse. Maven, Glad you were able to get one in spite of the Mah Jongg gathering. Someone suggested it before but should we revote on favorite posters now that we're halfway there? I'm curious to see how The Crash and Locke's Secret hold up to The Hatch and The Smoke Monster. It also seems that some of the non-sellout prints have been gaining popularity. NOOOOOOOOOOOOOOO it's sold out WHY?? the only poster i've r4eally liked so fay..
it has Lock, and the Hatch, and cogs int he background..
LT..and any others so interested; First ,big thanks for the crazy ride its been ,leading to the this reveal. A "fun" of a whole new dimension. And my condolences to all who came to this Print only to find it sold out. Yet, i've seen others sell out quicker. The very first thing we all saw of LOST,,was a close up of an eye opening up, Jacks eye. To me..it was a big red flag saying..we are dealing in Surrealism here!! !..The Eye has long been a " symbol" of Surrealism, as stated in an above post. So.. when it came to the "suspension of disbelief" decision...I did NOT suspend disbelief. I accepted the disbelief. I said,, nobody survives a jetliner coming apart at 30k or 20 k or 10 k ft. ..period. From there, I thought..if what is being presented is so unbelievable,,what of it?..The " surreal" idea of what is being presented is Illusion,,a untruth being presented as truth..a slight of hand..a magic trick of a Master Magician..an Illusion presented as Real...and continuing events of extreme exaggerations..miracles,monsters,,etc,,etc..have only reinforced my beginning perspective. a New Path. The message is in the metaphor. At this point it gets dangerous for me. I will start saying things that some just do not grasp and others just will not accept,,since they have invested 5 seasons in the suspending disbelief mode. I do not put down that mode of perceiving LOST. I just ask,,what has it got you but for a million questions,,deliberately not being answered...You see..I perceive the deliberate not answering the many many questions of the fans ,,as on purpose. The purpose of the non answers,, is for the creation of Mystery. The continued Mystery thru out the seasons of LOST is meant to push.. shove,,kick, the viewer into their own Imagination,,,Mystery for the sake of Mystery,,a Mystery that only each Individual can solve. This is the classic Magritte answer to the questions of his paintings.. what do they mean.? Mystery,, thats what they mean..the Mystery of the unexplored Imagination. The suggestion is,,go explore yours....So..now,,you may understand what I mean,,when I say,,rather than a bunch of unanswered questions at the end of each episode,,, I have fulfillment and enjoyment at the end of each episode. Of course this post is just the beginning. MEL I am closing my eye for now. I must suspend reality or opt for dysfunction. When I awake,, refreshed,, I'll throw on my best slippers, sip and digest your comment. Fantastic insight MEL. I must say, that is a perspective I had not considered. You have "opened my eyes" to a new way of viewing LOST. That comment deserves a blog post all of it's own Mel. I'll work on the new poll today now we are half way through. Dear MEL, I will hang ∞ right next to Ceci n'est pas une pipe. I spent a lot of time beween seasons 2 and 4 on ABCs boards, maybe we ran into each other before. I never used my real name, though. Please feel free to write the things that some just do not grasp and others just will not accept as an OP-ED on wantsomefish.blogspot.com. Most TV doesnt demand much of the imagination... and sometimes that's why we watch it. The L O S T mob expected a bit more from the viewer and it worked. However the most joyful aspect of the series for me is discussing the anomalies, teasing out meanings and metaphors,speculating on the motives of the writers etc etc.etc.etc. I dont want to go with the flow and just let it wash over me....I love the detail and feedback on the detaila as much as the show. The new poll is up, get voting. The Crash and The Hatch are the early contenders. MEL -- thought-provoking, thanks. And the producers would be saying thanks too if they read it b/c it lets them off the hook! Here is a link to Kevin Tong's photo of these on Flickr - they look great! Thanks for that LostinLondon, that's a great find. Have you seen one of the other pictures there, it has the posters in brown paper, and a blurred out image of some sort, I wonder if that is something important ? Nice link LostinLondon. The prints look great. I'm glad I was able to put in my order for this print 10 minutes before leaving for the Minnesota Twins division title game yesterday. Whew. Good ideas for a Sayid poster Cheif. Since he's the "McGuyver" of Lost, his radio experience would be well represented in a poster on him like you said. I hear you Knights, I was sleeping off a headache and missed the sale. Well, I can print out an 8x11 anyway, heheh. Very good thought Mel! Indeed, when we chose to willfully go down the rabbit hole in Season 1 like Alice, we opened ourselves up for falling into another world where most of the things we knew made no sense at all. Re: Locke Posters. I have about 40 left but am legally obliged not to sell them until some time next year. @Zort - appreciate the new poll. Looking forward to the final results! @lostinlondon - thanks for the link. Looks like this print extends to the edges of the stock. Might make it a little bit more difficult to frame depending on where the signature and print number go. 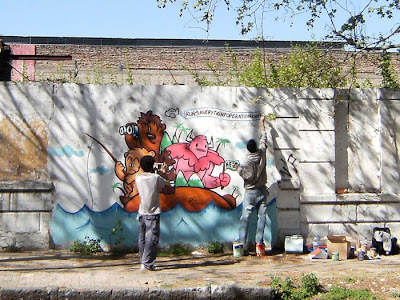 For those who don't know about it, there is a website called http://www.expressobeans.com/ that is an art collector's community website mostly dealing with graphic art. I had checked it out hoping to find someone willing to part with "Locke's Secret" as it allows you to track ebay listings as well. There is at least one Smoke Monster print for sale on ebay. I don't want to launch into a diatribe about overzealous profiteering (I was, after all, willing to look for one on sale), but they also have a mechanism by which people may offer to trade prints. I've noticed some of the LOSTARG family listed so many of you are probably aware of the site. Yes! There's a little bit of hope (which is always better than no hope, according to Christian) of us being able to buy copies of the ones we missed out on later. A bit behind on comments: @JPL: I emailed him again thanking him and wrote up a little piece about what happened yesterday on audibly lost. I don't really know what else to do. Hopefully he had fun in all this too. @sayid's girl and lost in london: thanks for the links (i had been looking for a high res version of the poster) Also I now saw that 1988 post slightly higher rez versions on their blog, which I understand is old news. As for the poll, it would be interesting to do one allowing people to choose more than one option as a lot of people may choose Locke's Secret or The Crash, etc. first, but have a second/third favorite that isn't one of those. Just a thought for the future. Nice of Olly Moss to let people know he's still got some and may be able to sell them next year. I hope whoever wants one can get it. Sandman- thanks for that website link. I also saw the Smoke Monster for sale on ebay yesterday because I was curious to know if any were being sold for mere profit...the seller actually came down in price from what they were asking originally. eh well. For a long time I thought I was the only one. Sayid, of the O6, is the only character who really had something to go back to the US for, and it was taken from him. Which makes him the most tragic character, and the most likable. Interesting that even though it's sold out, The Hatch doesn't have the red banner yet. Did Tyson take the day off? Great news for anyone who's going to buy in the future! "Our stores are back up! Thanks for being so patient while we were down yesterday. Use the discount code backup10 for 10% in any store"
Just tried the code with the love triangle and it said it was an invalid code. Shame. The hatch now has a Sold Out banner on it. It says Deus Ex Machina, the name of the episode. Is there any evidence to indicate that the artists are being given an episode to watch which has the "water cooler moment" in it, and are thus basing their art on the episode? I mean each poster seems to center around a particular episode, with the only possible exceptions being The Numbers and The Crash. Although the only item that would make The Crash not specific to the Pilot, would be the Dharma symbol in the upper left corner. The Numbers is a bit more difficult, as I'm not aware of any one Hurley episode that includes all of those images. Hey guys, this is Kevin Tong. Thanks for buying this poster and for discussing it. I also appreciate the deep discussions regarding it and have found them to be great reads. The Magritte comparisons are dead on. I definitely got a Magritte feeling from watching the show, like when Jack would see the figure in the suit on the beach. The title of the episode "Deus ex Machina" also fascinated me. Given John Locke's (the philosopher) views on the self/personal choice and the application of some external machine that can affect the reality we experience, I chose to depict the island as other worldly and mechanical in some ethereal way. I have a strong feeling the newest prints are going to be awesome. I hope the ones who missed out can get some future ones.